Did you know April is National Grilled Cheese Month? Or that this Thursday, April 12th is National Grilled Cheese Day? Yes there really is a food holiday for everything. 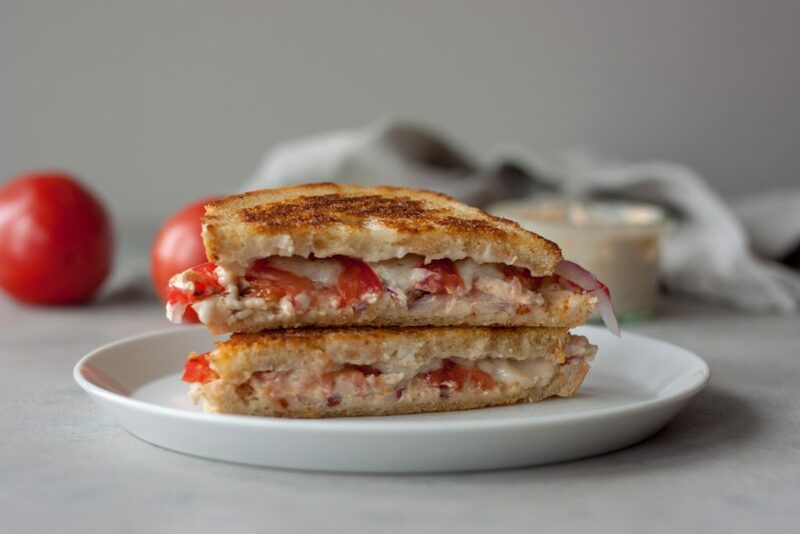 Perfect time to share this vegan Grilled Cheese Tomato Sandwich, an upgrade on a comfort food classic. Not a huge fan of grilled cheese, but have specifics I do crave, and this snowy April weather has me craving them. Especially since I found a way to finally make a favorite I haven’t had in far too long! Plus it pairs perfectly with a glass of white wine for a simple dinner that makes the snow falling outside not so bad. I don’t know if I really liked grilled cheese growing up but do remembered eating them. Take them or leave them though in my teen years, mostly leave them since dairy didn’t agree with me and I remember taking “dairy pill”. It wasn’t until I got older and a Havarti and Tomato Grilled Cheese made me like grilled cheese! That was probably over 10 years ago when I first had it and later recreated it with the version I posted 5 years ago. Even then it didn’t agree with me and up until this recent creation I have never been able to recreate it. 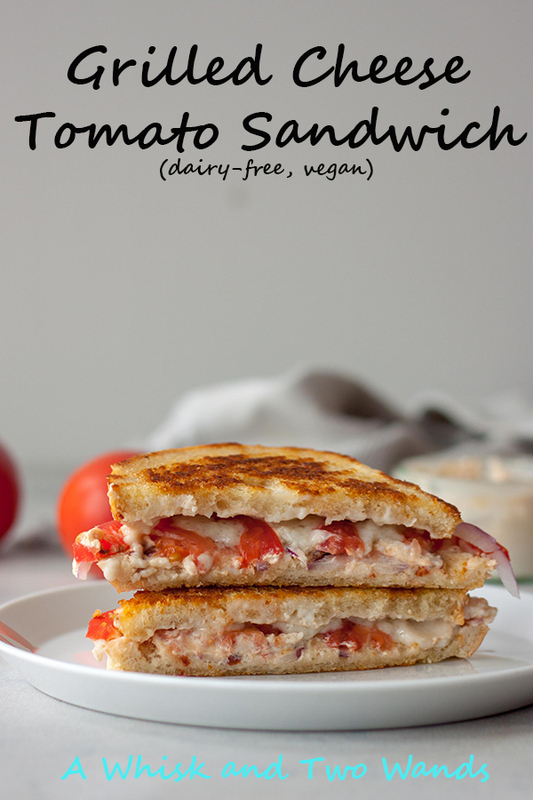 There have been changes in dairy free cheese over the years and Miyokos Fresh VeganMozz (which is my go-to cheese for pizza) that has been a game changer with grilled cheese but I still wasn’t able to make a Grilled Cheese Tomato Sandwich. Adding sundried tomatoes to a basic grilled cheese wasn’t the same. It wasn’t until a few weeks ago when Alisa posted this yogurt cheese. Dairy Free “Yogurt Cheese. 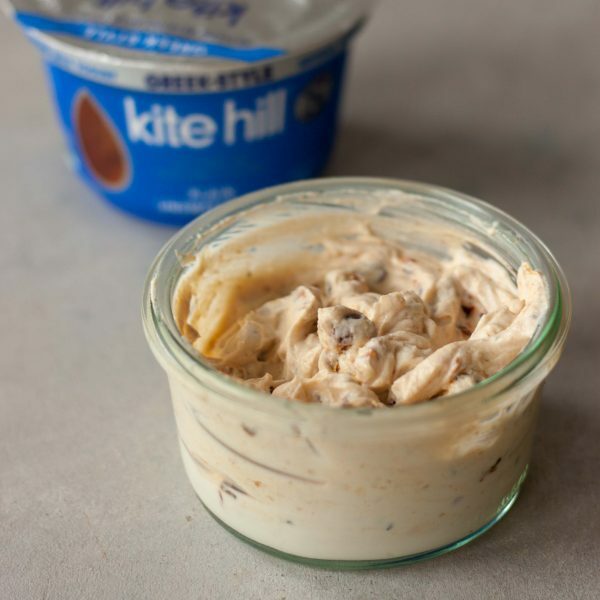 If you follow me on Instagram you may have seen that I’ve made a few versions, savory and sweet, and posted a Insta Story comparing two different yogurts I’ve tried Silk and Kite Hill, both Unsweetened Plain Almond Milk Yogurt. The texture is like a whipped cream cheese and instantly I thought about making a sundried tomato one and making a Grilled Cheese Tomato Sandwich. It was ahhmazing! It was like a moment and let me tell you I savored every bite of that Grilled Cheese Tomato Sandwich. So good I knew I had to share it for National Grilled Cheese Day even though I had other plans, I’ll get to those. Only problem is that after a couple attempts there was no way to get it to look photogenic. My husband said grilled cheese isn’t meant to be photogenic. I tried and tried, to the point I got hungry. Yeah guess he was right, shh don’t tell him I said that, but still too good not to share. That leads me to my what I had in mind for National Grilled Cheese Day originally which was getting that picture perfect grilled cheese that was dairy free and the key… tasted good. I was doing this for S and let me tell you there are a lot of dairy free cheeses out there that were spit into my sink. I even bought brands that we had tried before and didn’t like but after she tried some products at Expo I went back to those companies thinking maybe I was wrong back then and we’d give it another try, nope. Still confused as to how a company can make lets say a cheese slice and shredded cheese both the same “flavor” and one is good and one is awful? So with that I gave up, didn’t even find the one that I used to make a bean and cheese burrito last year that I loved and so did the family and thought I tired them all. Sorry I’m not usually a quitter but when S said she isn’t really a fan of grilled cheese and how many times I gagged I gave up and we’re sticking to the winners we did have…. Miyoko’s (not sponsored as I’ve said many times), and this new found love for yogurt cheese! If you’re more of a traditional grilled cheese person I have spiced up that too with another version coming later this week! What’s your favorite grilled cheese combo? 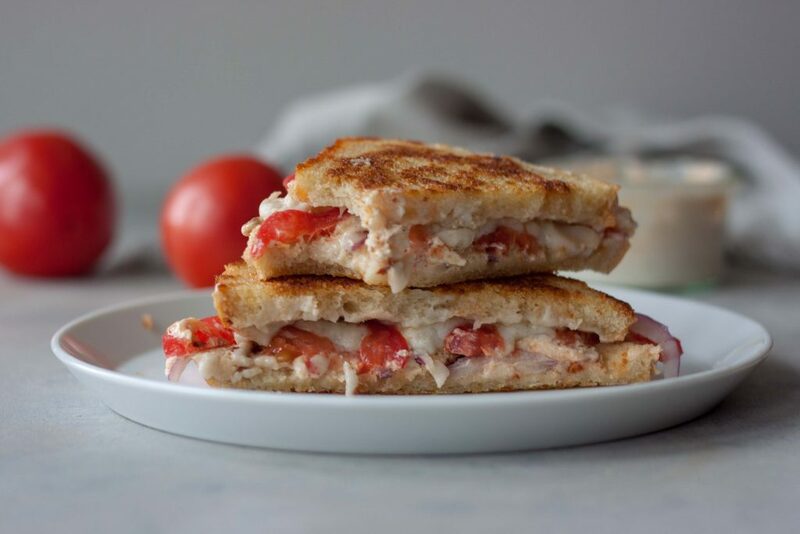 Comfort food classic grilled cheese gets an upgrade with this dairy free (vegan) Grilled Cheese Tomato Sandwich. Gluten free friendly this sandwich is great for lunch or perfect for dinner paired with a glass of wine. Heat a large cast iron pan, griddle, or skillet over medium high heat. Spread the outsides of your slices of bread with butter spread or spray/brush with oil. Shred, or slice, Vegan Mozz or your cheese slices on one slice of each of the sandwiches and set buttered side down on pan. Cover if needed for your cheese to melt but not too long or the whole time or you will have soggy bread. If you have issues with your cheese melting see notes. Thinly slice tomato and lay on top of the cheese along with onion slices. 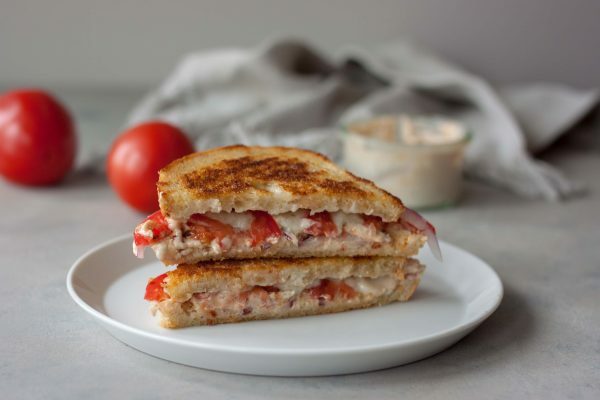 Spread the remaining two slices of bread with Sundried Tomato Yogurt Cheese and place cheese side down on top of the sandwich. Flip sandwich when golden brown to cook the other side, cooking until golden brown. If you have dairy free/vegan cheese that isn't melting, or takes longer, I've found two things that help. If you want you can take a slice with the cheese, not the whole sandwich, and heat in the microwave until the cheese starts to melt. At this point put on a hot cast iron or griddle to brown and crisp the outside and assemble the rest of your sandwich. Too often I hear people putting it in the microwave after, with any cheese not just dairy free when it isn't melting fast enough, which makes a soggy sandwich. The other is to keep the heat down and cover the pan so the cheese melts and then turning the heat up to brown and crisp the outside. A dreamy whipped cream cheese like textured Sun-dried flavored yogurt cheese inspired by Go Dairy Free, Dairy Free "Yogurt Cheese. You will need to plan head for this as you need to strain the yogurt for 24 hours and then use within 3 days of making it. Place a strainer on top of a cup or bowl. Line the sieve with 2-3 layers of cheesecloth. Scrape the yogurt into the center of the cheesecloth. Bring the corners of the cheesecloth together and gently twist to enclose the yogurt into a round. The yogurt will have thickened at this point to a whipped cream cheese like consistency. Remove cheesecloth and place yogurt cheese into a bowl. Roughly chop sundried tomatoes and fold into the yogurt cheese. Season with sea salt to taste. Store in an airtight container in the refrigerator until ready to use or for up to 3 days. I am not a traditional grilled cheese fan so this is really something that I know I would love. It sounds creamy, flavorful and so delicious! Right there with you, I’m not a huge fan but I’m a big fan of this one! This looks mouthwateringly delicious! Hooray for National Grilled Cheese Month! I had no idea it was National Grilled Cheese month! What a way to celebrate. The sandwich looks delicious. What a great option for those who need to avoid dairy. Yes and this Thursday is National Grilled Cheese Day, which I knew but didn’t realize it was also all month until last week. Since you can have dairy you can make the version I linked to above, that was a favorite and I think you’d love it! Love grilled cheese! I think my favorite combo is grilled cheese and pickles. I love pickles, so I’ll have to try that! Oh my goodness Sarah, you really take an idea and run with it! I’m so honored that I could start something that inspires you so much 🙂 And this sandwich – unreal! I knew once I first tried it that this would be one thing I had to try to make with it and it was seriously love at first bite! Thank you! Love this! One of my most popular recipes for Shape is a vegan sweet potato grilled cheese! So much yum! Oh I need to check that out, sounds like something I’d love! This looks incredible! 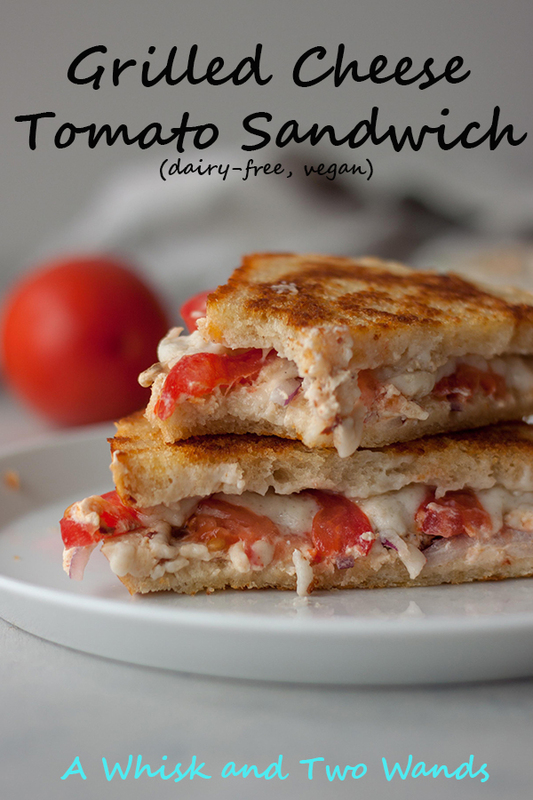 What a delicious option for those who are dairy free – because I mean, who doesn’t love a good grilled cheese? I’m not a huge grilled cheese fan honestly but crave one every now and again. This is a great classic sandwich! I need to make one now! Thanks for reminding me about it! Oh my goodness. I need this for basically every meal! Looks delicious!